Well, for starters, there is no arguing about the fact that camping and outdoor fun keeps getting interesting by the day. Now, one thing that makes camping fun and interesting is the convenience of having a bunk bed cot. So, as you take some time away from home, the restricting city life and the nagging technology that comes with it, the one thing you wish to do is sleep cozy, just as though you were back home. This can only be made possible by using camping bunk beds. Bunk bed cots ensure that you do not strain your back in the course of camping and as you rest at night. But there are quite many bunk beds for camping in the market and therefore it can be hard for you to choose the best one since, at first glance, they look almost the same. However, after reading this simple guide, it should be easy for you to pick the right one. You will get value for your money. Note: click here if you are looking for one-story camping cots. This bunk bed is ideal for nearly anywhere. Be it in the woods camping or when you are at the beach having the time of your life. The good thing with this particular cot is that it has all the necessary accessories needed to have the best and sound sleep. Once the bunk cot is set, it can serve to hold two or three people for the night. When you compare this kind of convenience and weigh the expense of sleeping on the ground, having portable bunk beds is a necessity when you intend to go camping. This bunk cot is also multifunctional. While during the night, the cot serves as two beds, in the day it is possible to convert the bunk to a bench so that the whole family can sit on as you take lunch or read a book. The bunk bed cot does not require a ladder, which means that even children find it easy to use. The frames are made of coated steel – a long-lasting material. The steel coating is so that the frame will resist rust and stand the test of time. 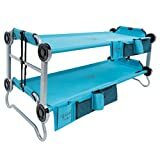 It has two organizers that are carefully attached to the sleeping deck. The organizers help an individual store their personal items in there as they retire to bed. It is available in different colors for preference. The dimension of the bunk cot is 11 x 16 x 34 inches (28 x 40 x 85 cm) and weighs 62 pounds (28 kg). It has a bunk assembly process that does not require any tools. Just one person can complete the set-up process. In case of damage, it is possible to buy individual items for replacement rather than having to buy an entirely new portable bunk cot. The weight tolerance is that of 500 lbs (227 kg) for every single bed cot. The cot material is polyester. Tip: If need be and depending on the terrain of the camping area, it is prudent to get footpads for protection and durability. The footpads will also help to ensure that the bunk bed cots are stable even on grounds that are not even. Click here to read a more extensive review of Disc-O-Bed Cam-O-Bunk Cot with 2 organizers. This particular bunk cot is easy to wash and maintain. All you need is warm water and mild soap. After washing, it is prudent to ensure that the bunk cot is dried completely before folding and storing. This bunk bed does not take too much of the tent space and as such is very convenient for outdoor fun. As the name suggests, this camping bunk bed is designed for kids and youngsters. It has no middle leg or center support. The sleeping deck is thus flowing, wide and long for comfort and support. It has polyester bags for storage and transport. The bags are two for convenience and to ensure that no too much accessories are packed in one bag. It supports a weight of 200 pounds (91 kg). This camp bunk bed measures 65 x 32.5 x 32 inches (163 x 81.3 x 80 cm) when unfolded. Powder-coated steel frame and polyester material for the cot bed. The advantage of this bunk bed is that it is affordable and very easy to set up. It is also durable and it can fit even in the smallest of places in the tent. For instance, when there are many of you going camping and space is limited, this is the kind of portable bunk bed to bring along. A Disc-O-Bed has innovative structures. You can use two cots differently as a bunk bed. That way, two people can sleep in the bunk cot, saving on space especially when you want to save on tent space while camping. The sleeping decks are well ventilated to let in fresh air and keep humidity under control. The sleeping decks can be removed for easier cleaning to maintain the proper kind of hygiene. Of course, you need to ensure that the sleeping deck is dry enough for storage. This extra large bunk cot is the best sleeping system when venturing into the woods to camp as a family. The bunk cot holds the record of one among the many bunk cots that can hold the weight of 500 lbs (227 kg). It comes with carrying bags where the different parts of the bunk cot are stored. Having bags is a good security measure since all the parts are fastened to prevent them from damage or from falling out from the bag. Because of the extra large size, this bunk can hold a more capacity than most other bunks in the market. This is a good fit for the family when going camping. The bunk cot is versatile enough to be used either as a bunk bed in the night or a bench in the day. It does not require any tools to assemble. When assembled, the bunk cot has a dimension of 79 x 34.5 x 32 inches (200 x 86 x 80 cm). Has a weight capacity of 500 lbs (226 kg). Weighs 66 lbs (30 kg). The organizers in the bunk bed cot will help to store personal items safely in the course of camping. Additionally, the frames of the bunk bed are heavy duty for strength and durability. This Disc-O-Bed Cam-O-Bunk with Leg Extensions and cabinets is not only a convenient camping bed, but it also comes with extras, as its long name suggests – the leg extensions and the cabinets. The latter are added for extra convenience and to help you organize all your personal items since you will have enough space. The decks are made of 600D polyester. Can be assembled faster without using any tools. Has rails and straps for attaching and securing the cabinets. Has steel frames that are powder coated to withstand the elements. The Disc-O-Bed organizers have a pair of pen pockets, a pair of netted pockets, zippered sleeves and more. Can be restructured to be used as a bench, two cots, a single bunk or double bunk. Each cot can support 500 lbs (227 kg) of weight. Ground clearance is 11 inches (28 cm). Space between the lower and upper cot is 28 inches (70cm). When assembled, this bunk measures 79 x 34.5 x 39 inches (198 x 86 x 98 cm). Weighs 91 lbs (41 kg) when packed. Has 7 inches (17.5 cm) leg extensions for a larger distance between the cots and for ground clearance. If possible, ensure that the one you would like to buy has rubber feet to protect the floor if you intend to use it indoors at home. The bunk cot can be a bit noisy. At some point, the portable camping cot is squeaky and rattles a lot as one shifts sides. For people who are light sleepers, this noise can be disturbing to an extent. Look for bunk cots that fit snugly and which make little or no noise when the sleepers turn. After having selected either of the above portable bunk beds, the next step is making the purchase. You need to consider a few factors when making the purchase. Read through and get some insight into what will or will not work for you. Every bunk cot will hold different weights. Exceeding the designed limit may damage the bunk bed and this will work to your disadvantage. The secret thus is to get a bunk cot that will handle the kind of weight that you intend it to. So, always ensure that you get the weight limit right before you buy the bunk bed. The height limit is another factor. For the tall people, it is important to look for a camping bunk bed that will support the height to sleep comfortably in the night. You do not have to run the cost of repairing the bunk bed for a fault that was not yours. This is the where the importance of a warranty comes in. To be on the safe side, ensure that you get a bunk bed cot that has a warranty in case of any fault in the bunk bed after purchasing. The material, in this case, will focus on the different aspects of the bed. Firstly, consider frames that are made of steel, titanium or aluminum, and this material must be high grade. Secondly, ensure that the cover can withstand any temperature and is easy to wash and maintain. At the end of the day, you need to find a bunk cot that is lighter to reduce on the baggage you need to carry along with you to the camping grounds. The bunk cot should be portable but sturdy enough to last the recommended time. Now you know what is available for sale in the market after reading those short reviews. need to select your desired bunk cot. So far, Disc-O-Bed Cam-O-Bunk with 2 Organizers, Tan/Green, X-Large is the best since it can serve many purposes and two individuals at the same time. However, at the end of the day, the decision lies with you. But if you look at the Amazon reviews, you will get a better glimpse of the different kinds of camping bunk bed cots that will serve you for as long as you want. Oh wow. This is what I need for me and my sister. We co camping like crazy.